Don’t know what a unity ceremony is? Unity ceremonies are a mark of coming together, a symbol of togetherness. They can be lovely traditions to include on the day as they’re flexible and are open to include important family members, such as the bridal couple’s parents, or children from previous marriages. This is possibly the most popular. 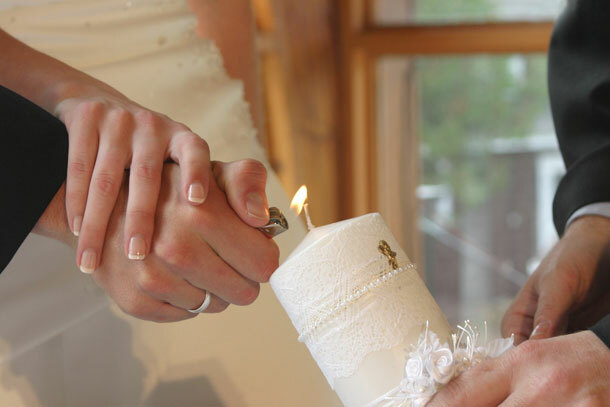 Bride and groom each take up a lit candle and light a third, larger ‘unity candle’ together. The candles they use to light the unity candle may remain lit or they can blow them out – the symbolism remains the same and indicates that neither has lost their individuality despite uniting in marriage. A variation on the theme is that each guest is given a candle. The flame is then passed from guest to guest as each lights the candle of the person next to them. Each of you has a different colour sand, which together are poured into a single glass or bottle, symbolising the unity of the couple or family. This works particularly well to include children from a former marriage. You can do similar for water or wine. This is a very old tradition that is described in the Bible and is often a feature of Jewish and Indian weddings, but is lovely to include any non-Jewish weddings too. The bride passes a handful of salt to the groom without spilling any (quite an art). He then passes it back to her. This is repeated roughly three times, after which the salt is exchanged with members of the groom’s family, symbolising her acceptance into her new family. This is a lovely way to symbolise the future together as a family. The bride and groom each tear off pieces of bread and eat it. Better still, you can share a piece. This same ceremony will be repeated often at their table through their lives together. A very simple unity ceremony, but no less impactful, is for the bride and groom to exchange roses. A variation is that after exchanging roses, each of them give their roses to their mother.